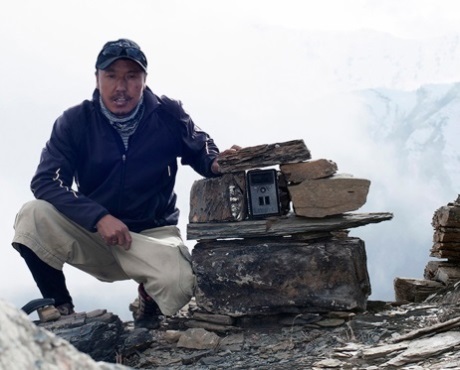 A hotel manager and photographer, Tashi R. Ghale, a local resident of Manang, has remarkable experience in snow leopard monitoring. A member of the Snow Leopard Scouts, he has captured on camera multiple images of beautiful snow leopards. He has also seen the cats many times right in front of him. 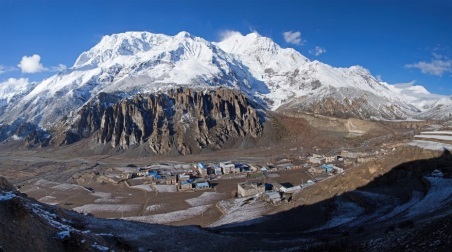 In 2005, the world’s leading snow leopard expert, Dr. Rodney Jackson, and his wife, conservationist Darla Hillard, made a visit to Mustang in Annapurna. When Tashi heard the couple was in Jomsom (district headquarter of Mustang), he made a 2-day trek from Manang crossing the Thorong La high altitude Pass at 5416 m to meet them. “Actually, I first met Darla in 2004, during a 12-day nature guide training,” Tashi recalls. Darla, who attended the training for three of the days, gave Tashi the idea of using camera traps to explore and monitor snow leopards in his village Manang. Meeting with Rodney for only a few hours in Jomsom, Tashi learned how to operate a remote camera and identify snow leopard pugmarks. He received valuable information from Rodney about how snow leopard maintains its territory, likely locations to find them and most importantly, where to place the remote-camera. Luck turned out to be on Tashi’s side. A pair of snow leopards with a cub had been captured in Kerken pasture (3750 m). Similarly, two isolated snow leopards were captured on film at Gunchang. “There was no limit to my astonishment! I was extremely happy. I scanned the image and sent it to Darla immediately. Darla congratulated me.” That was the first camera trap evidence of snow leopards in Manang. Tashi is an indispensible member of the Snow Leopard Scouts created by Snow Leopard Conservancy to support Annapurna Conservation Area Project for snow leopard monitoring. He fondly recounts his encounters with snow leopards with the younger Scouts and conducts informational sessions on snow leopard habitats at various environmental camps.